Weight Watchers: 4pp per serve. Soak skewers for 30 minutes. 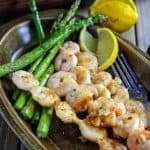 Thread prawns onto skewers and combine all marinade ingredients together. Marinade prawns for two hours or over night for a deeper flavour. Pan fry prawns on medium - high heat until cooked to your liking. Serve with lemon wedges and steamed greens or a salad!